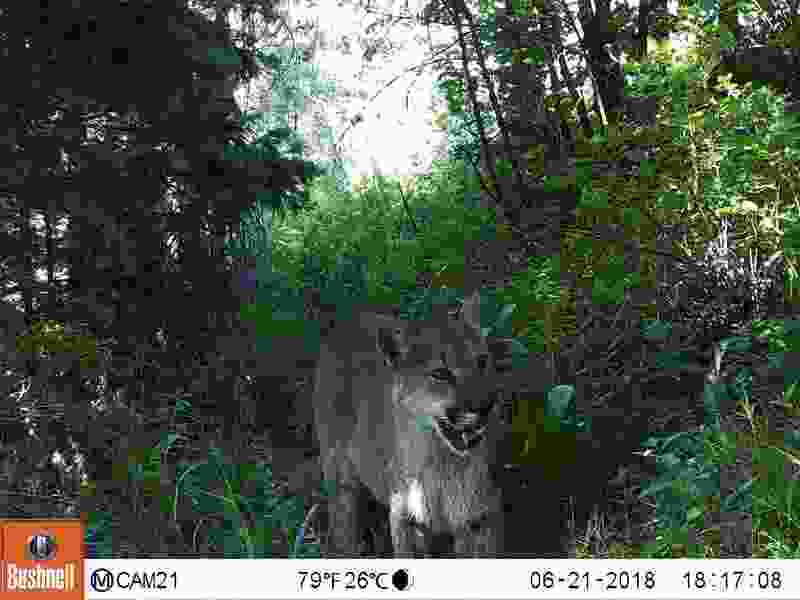 (Photo courtesy of the Wasatch Wildlife Watch project) A motion-triggered camera recorded this image of a mountain lion in Parleys Canyon in June 2018 as part of University of Utah research. A hunter recently killed a cougar in Eden, firing his gun within 600 feet of homes and violating state law, according to Division of Wildlife Resources officials. The killing has ignited debate among residents about how to share space with wild animals, as Utah’s population grows and development encroaches on habitat. Eden • The recent killing of a cougar near homes in a small Utah mountain town has spurred debate among residents about how to live in the same habitat as the predators. The hunter with the help of a guide tracked the animal to a wooded ravine, and fired his gun within 600 feet of homes, violating state law, said Trevor Doman, a conservation officer with the state Division of Wildlife Resources. The hunter had proper permits, but he and his guide received warnings from the state for the shooting. Doman said the guide for the hunter told him that the animal was "causing havoc" in the area by killing deer and dragging them near homes. Before the big chat was shot, residents posted on community Facebook pages about sightings and tracks. The comments were intended as a "be-aware type of thing," instead warning of an imminent threat, resident Sean Healey said. The residents' concerns about the cougar might have been overblown, Healey said. The cats can pose risks, but they should not "all be killed just because they're near us," he said. "I don't think we should overreact to the presence or be surprised by the presence of predators from time-to-time," Healey said. Merrill had heard reports of cougar attacking goats last year, but then "to have one out in the daylight, right out in front of your house where your kids play — that's kind of scary," he said. As Utah's population grows, people are increasingly edging into the habitat of wild animals, leading to occasional encounters.